Air Force Maj. Dan Rooney (ret.) 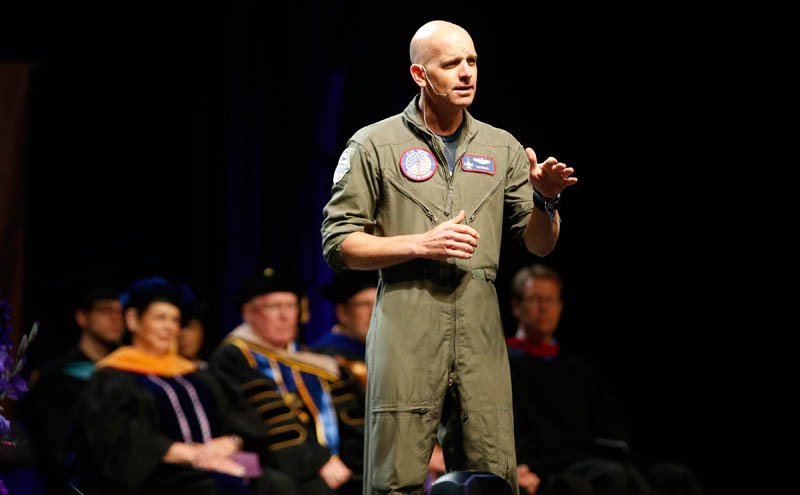 is unusual in a lot of ways, but how about this for something that sets him apart for your typical commencement speaker: Between the morning and afternoon Grand Canyon University ceremonies Thursday at Veterans Memorial Coliseum, he went to a local gym to work out. Rooney, who served three tours in Iraq and earned numerous medals, told the story of how, after a commercial flight from Chicago to Grand Rapids, Mich., the pilot announced to him and the other passengers that “an American hero was on the plane.” The pilot asked them to remain seated and let the soldier exit first. Expecting someone on the flight to stand up, Rooney was jolted by what he saw next: the flag-draped coffin of an American soldier, Cpl. Brock Bucklin, coming down the baggage ramp. Bucklin’s family, including his 4-year-old son, was waiting below. The soldier’s twin brother, Brad, also a corporal, had been on the flight, escorting his brother home. Rooney was moved to action. And one thing you learn very quickly about this 1996 University of Kansas graduate is that he is a real-life action hero. During his third tour flying F-16s over Iraq, Rooney decided to do something for the families of fallen and disabled veterans. In 2007, he founded, in the room above his garage, the Folds of Honor Foundation, which he said has raised $40 million and handed out more than 7,000 scholarships. He didn’t stop there. He wrote a book, “A Patriot’s Calling,” became a much sought-after member of the prestigious Washington Speakers Bureau and has been profiled by a long list of major media outlets. “I knew with every fiber of my being that this is what I was supposed to do with my life,” he said. Talk to Rooney one-on-one, though, and you gain an even greater appreciation for what he’s all about. His goal is for every American to read his book, not because he has a big ego but because he believes he has important messages to share about God and country. And he is very aware that the spotlight is on him 24/7, not just to be an excellent motivational speaker but to carry it over into his everyday life and be the best husband he can be for his wife, Jacqy, and the best father he can be for his five daughters, who range in age from 12 years old to seven months. Rooney said he actually is thankful he didn’t make it through the first stage of qualifying for the Professional Golfers’ Association (PGA) Tour in 1997, because he never would have become a fighter pilot if he had earned his Tour card. He played in a few mini-tour events and is satisfied today to be a club professional and golf course owner. Instead, he spends virtually all of his time on Folds of Honor and giving about 25 speeches a year. Thursday’s talk was his first college commencement address, but there’s one thing he never tires of doing: telling stories about how synchronicity affects his life daily. On Wednesday night, Rooney appeared at a fundraiser in Palm Springs, Calif., and was being driven to Phoenix by one of the young helpers at the event. Somewhere out in the middle of nowhere on Interstate 10 a little before midnight, they ran out of gas, but Rooney saw it as a blessing – and a teachable moment. The first blessing was that a gas station just happened to be about a half-mile up the road. But then the embarrassed young man, who hadn’t checked the fuel gauge before the trip, got a bit of education from a guy who used to risk his life regularly. “Major Dan, please don’t tell my boss,” he told Rooney. That earned the young man an impassioned talk about responsibility. The students and family members who heard Rooney speak on Thursday got a life-changing experience as well at an event designed to fuel ambitions. This speech definitely worked out. Contact Rick Vacek at 639.8203 or rick.vacek@gcu.edu.